Acidic wastewater from an abandoned mine above Silverton coursed its way through La Plata County on Thursday, turning the Animas River orange-brown, forcing the city of Durango to stop pumping raw water from the river and persuading the sheriff to close the river to public use. Residents lined the banks of the Animas River on Thursday afternoon to watch the toxic wastewater as it flowed through Durango city limits. But the sludge slowed as it snaked its way through the oxbow in the Animas Valley, and the murk didn't arrive until after 8 p.m. The accident occurred about 10:30 a.m. Wednesday at the Gold King Mine in San Juan County. A mining and safety team working on behalf of the Environmental Protection Agency triggered the discharge, according to a news release issued by the EPA. The EPA's team was working with heavy equipment to secure and consolidate a safe way to enter the mine and access contaminated water, said Richard Mylott, a spokesman for the EPA in Denver. The project was intended to pump and treat the water and reduce metal pollution flowing out of the mine into Cement Creek, he said. 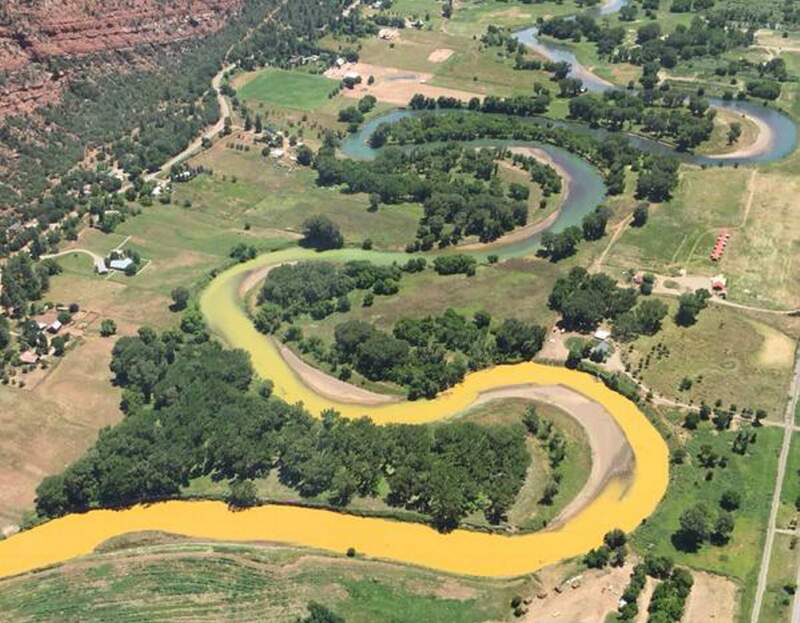 The disaster released about 1 million gallons of acidic water containing sediment and metals flowing as an orange-colored discharge downstream through Cement Creek and into the Animas River. The Animas River was closed to tubers, rafters and kayakers Thursday as the toxic plume made its way through Durango. The closure went into effect at 3 p.m., and it will remain in effect indefinitely until the river is deemed safe, said La Plata County Sheriff Sean Smith. Government officials aren't certain what toxins and at what levels toxins are present in the river, and, therefore, decided it was best to close the river to public use. The closure, which applies to all flotation devices, is in effect for the entire stretch of the Animas River in La Plata County. The city of Durango stopped pumping water out of the Animas River on Wednesday to prevent contaminating the city reservoir. The Animas is an important secondary source of water for the city during the summer, and residents need to conserve as much water as possible over the next few days until the water is safe to use, said Steve Salka, the city's utilities director. No formal water restrictions were issued. At south City Market, Sean Lumen, who was hoisting bottled water onto emptied shelves, said if customers continued to buy water at Thursday's rate, the store would run out sometime Friday. At Albertsons, front-end manager Shelley Osborn said she initially thought people were buying up bottled water at an unusually rapid rate because it was on sale. Aaron Memro, grocery manager, estimated Albertsons sold two pallets of water Thursday – far more than usual. During the emergency, Salka will not send raw water to Hillcrest Golf Club or Fort Lewis College for grounds use. The city also will not water any city-owned parks for the next three days to help conserve, he said. On hot summer days, the city can use up to 9.2 million gallons a day. But the city can pump only 5.3 million gallons a day out of the Florida River. The city reservoir was about 4.5 feet below capacity on Wednesday, Salka said. “This couldn't happen at a worse time for me, so I have to be really cautious,” he said. Colorado Parks and Wildlife placed four cages containing fish in the Animas River to monitor what happens to them, said spokesman Joe Lewandowski. The cages were placed at 32nd Street, the fish hatchery, Dallabetta Park and the High Bridge. Peter Butler, co-coordinator of the Animas River Stakeholders Group and former chairman of the Colorado Water Quality Control Commission, said it remains to be seen whether the toxic metal concentrations flowing downriver will impact the few fish species living below Bakers Bridge. But if the plume does have a negative impact on aquatic life, Butler estimated that fish would die within hours of contact with the plume. The contaminated water made its way to Bakers Bridge in La Plata County by Thursday morning and hit town by Thursday evening. The material was expected to cross the New Mexico state line between 4 and 5 a.m. Friday and arrive in Farmington on Friday evening. Farmington city officials shut down all water-supply intake pumps to avoid contamination and advised citizens to stay out of the river until the discoloration has passed. Local officials asked all agricultural water users to shut off water intakes. Butler said the water being discharged from Gold King carried high concentrations of iron, aluminum, cadmium, zinc and copper. Butler said Colorado Division of Reclamation, Mining and Safety scientist Kirstin Brown had tested pH levels – the telltale measure of acidity in water – in the Animas River at Trimble Lane when the toxic plume arrived. The pH level dropped from 7.8 to 5.8. “That's a pretty big drop,” Butler said. Silverton does not use water from Cement Creek, so its water source remained uncontaminated, said William Tookey, the San Juan County administrator who met Thursday with EPA officials. The Animas River was looking healthier about 24 hours after the discharge in Silverton, he said. This is not the first time there has been a water-related accident at one of the mines, but it did come as a surprise to the town, Tookey said. He was not sure if the release would change attitudes toward the EPA in town. For years, some town residents and local officials have been opposed to a Superfund listing. “Since it was the EPA that was responsible for this, it may make people less likely to be open to them,” he said. Butler said everyone invested in improving the Animas River's water quality wanted to get into Gold King, because, for years, it has been one of the two biggest contributors of heavy-metal loads in the Animas Basin. “They had a plan for handling the mine pool, but something went wrong, and it all came blowing out,” Butler said. EPA teams will be sampling and investigating downstream locations over the next several days to confirm the release has passed and poses no additional concerns for aquatic life or water users. Mine blow out A Mining and Safety team working to investigate and address contamination at the Gold King Mine in San Juan County, Colo. unexpectedly triggered a large release of mine waste water into the upper portions of Cement Creek, which flows into the Animas River. A Mining and Safety team working to investigate and address contamination at the Gold King Mine in San Juan County, Colo. unexpectedly triggered a large release of mine waste water into the upper portions of Cement Creek, which flows into the Animas River. Rayna Willhite of Aztec holds a bottle of water collected from the Animas River on Thursday near Bakers Bridge. The river is carrying mine waste from the Gold King Mine north of Silverton. 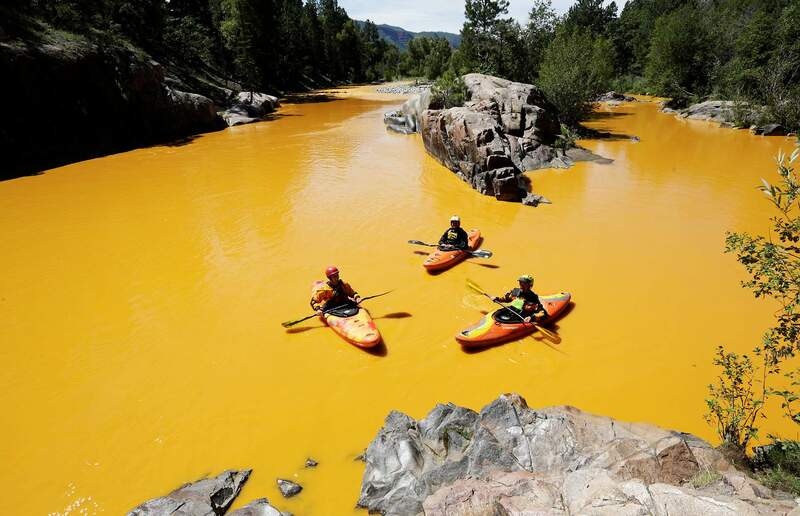 08/06/2015- Kayakers, Dan Steaves, Eric Parker, and David Farkas, find themselves in the Animas River north of Durango on Thursday that is filled with toxic mine waste that flowed into the river from the Gold King Mine north of Silverton. An orange-colored discharge of sediment and minerals makes its way down the Animas River-Cement Creek junction about 4:30 p.m. Wednesday in Silverton, about eight miles downstream from a blowout at the Gold King Mine in San Juan County. The contamination made its way to Bakers Bridge in La Plata County as of Thursday morning. Contaminated water from a blowout at the Gold King Mine above Silverton turned the water orange-brown Thursday morning in the Animas River at Bakers Bridge. Water flows down an irrigation ditch Thursday north of Durango filled with toxic mine waste from the Animas River. Clear water mixes with the contaminated Animas River on Thursday north of Durango. The Animas filled with toxic mine waste that dumped into the river from the Gold King Mine north of Silverton. Dan Bender with the La Plata County Sheriff’s Office, just north of Durango on Thursday, takes a sample of the Animas River that is carrying over a million gallons of toxic mine waste that came down from the Gold King Mine north of Silverton. Kayakers Dan Steaves, Eric Parker and David Farkas talk with a group of spectators as they exit the polluted Animas River north of Durango on Thursday that was filled with toxic mine waste that dumped into the river from the Gold King Mine north of Silverton. A crowd at 32nd Street waits for signs of the mine waste coming downstream. 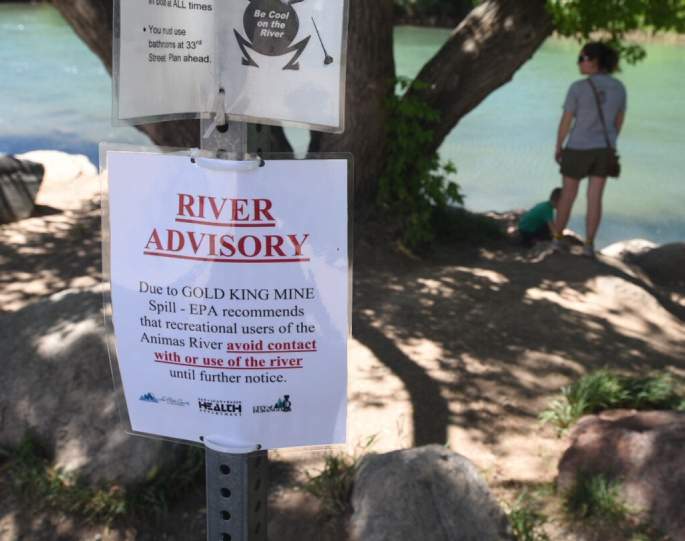 The La Plata County Sheriff’s department closed down the Animas River because of the Gold King Mine leak that dumped over a million gallons of waste into the river. “The water tastes like iron,” Eric Parker said as he floats down the Animas River near Bakers Bridge on Thursday morning after his group ended up in the toxic mine waste that flowed into the river form the Gold King Mine north of Silverton. Among the last tubers to go down the Animas River before it was closed to all recreation because of the Gold King Mine toxic waste spill pass by Rotary Park ahead of contaminated water. 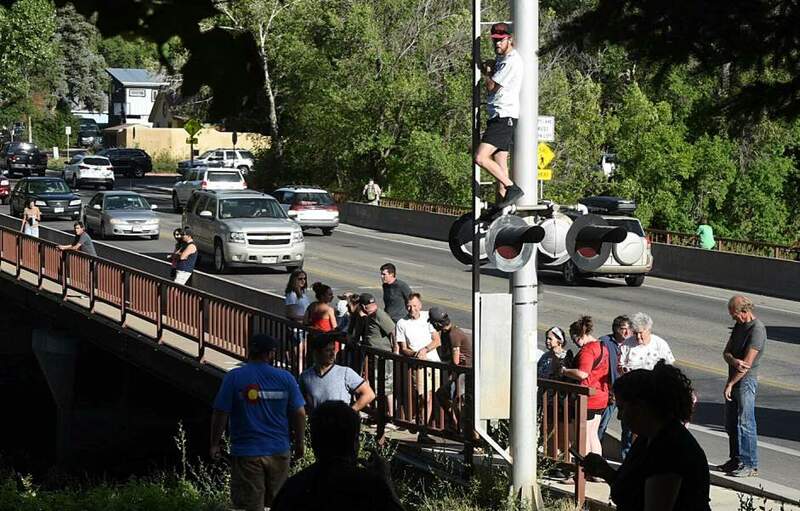 Residents gather on the bridge at 32nd Street on Thursday afternoon to watch the pending toxic mine waste flowing their way in the Animas River. Abbie Jefferson, left, Jim White, right, and Pete Cadmus of Colorado Parks & Wildlife set up cages with Rainbow Trout fingerlings Thursday near the High Bridge to gauge the effect of mine waste on fish after the contamination on the Animas River. 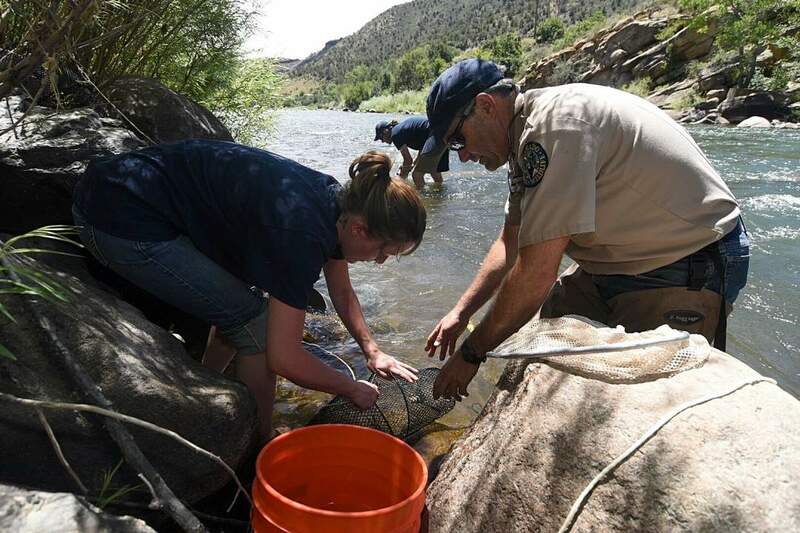 Abbie Jefferson, Jim White and Pete Cadmus of Colorado Parks & Wildlife tried to gauge the impact on fish Thursday in the Animas River after the Gold King Mine spill. Pete Cadmus of Colorado Parks & Wildlife takes water samples on the Animas River at 32nd Street. Mark Tucker of Durango Fire Protection District talks to Ashleigh MacLennan and Terry Rickard about the waste flowing downstream Thursday at the 32nd Street put-in. Officials are asking people not to get in the river because of the contamination. Onlookers at Oxbow Park and Preserve on Thursday check out the mine waste ooze down the Animas River. Playing in the Animas River ahead of the contaminated water, Jeremy Ham, right, took his two daughters, Wrigley Ham and Camden Ham, on their very first inner-tube ride Thursday down the Animas River. 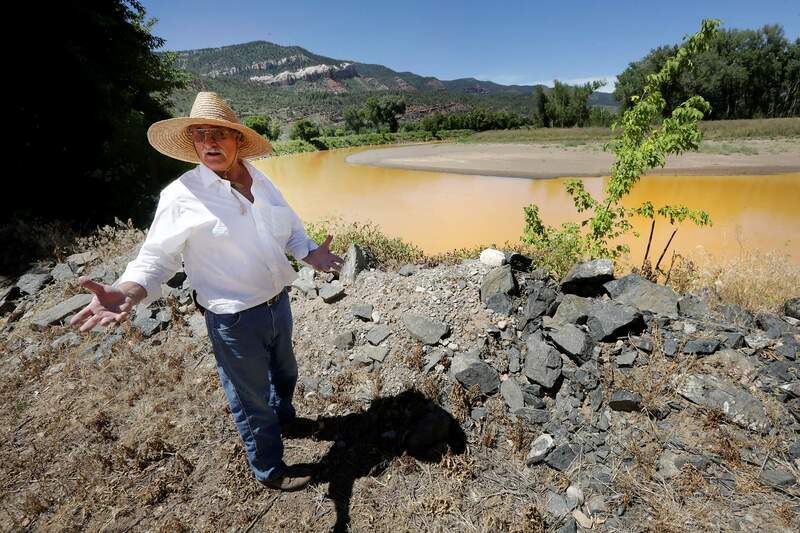 Dave Kendall is totally shocked as he looks at the Animas River behind his ranch Thursday north of Durango that is filled with toxic mine waste that flowed into the river from the Gold King Mine north of Silverton. Kayakers Dan Steaves, Eric Parker and David Farkas on Thursday find themselves surrounded by the toxic mine waste that flowed into the Animas River from the Gold King Mine north of Silverton. Kayakers Dan Steaves, Eric Parker and David Farkas find themselves surrounded Thursday by the toxic mine waste that began flowing Wednesday into the Animas River from the Gold King Mine north of Silverton. A call center has been set up for the public at 385-8700. Information is available on La Plata County's website at www.co.laplata.co.us/emergency, San Juan Basin Health Department's website at www.sjbhd.org, the La Plata County Government Facebook page and the San Juan Basin Health Department Facebook page. What’s next for dealing with toxic river flow? KOB-TV in Albuquerque flew over the Animas Valley on Thursday afternoon and captured the toxic wastewater in the Animas River. The wastewater, spilled from the Gold King Mine in Silverton, quickly wended its way downstream from Silverton to Durango. Abbie Jefferson, left, Jim White, right, and Pete Cadmus, all with Colorado Parks & Wildlife, set up cages Thursday with rainbow trout fingerlings near the High Bridge to gauge the effect on fish from the toxic mine wastewater that was released accidentally into the Animas River. “I’m sad about it. It’s scary,” said Corrie Downing, who went to the 32nd Street put-in to see the plume of Gold King Mine waste as it makes its way toward town. 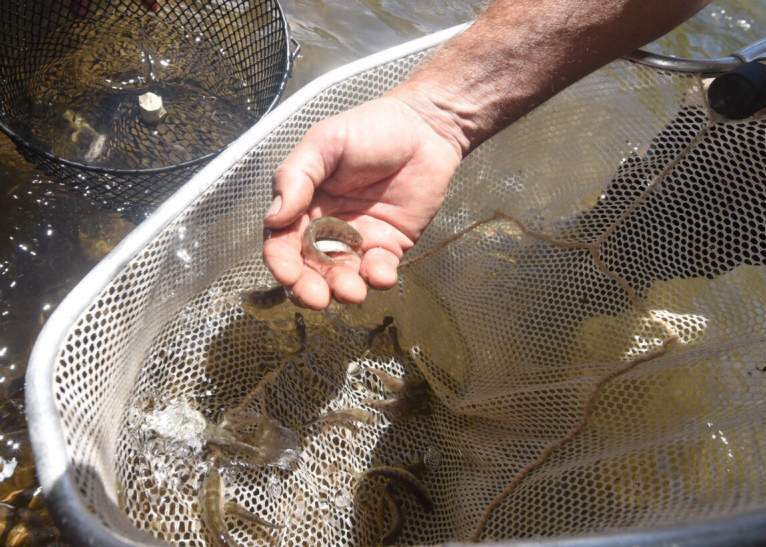 Colorado Parks & Wildlife set up cages Thursday with rainbow trout fingerlings near the High Bridge to gauge the effect on fish from the Gold King Mine toxic spill into the Animas River. Dave Kendall is shocked as he looks at the Animas River behind his ranch Thursday north of Durango. 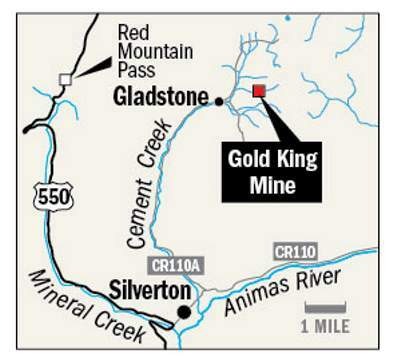 The river began to fill with toxic mine waste Wednesday after a mining and safety team working for the Environmental Protection Agency breached a bulkhead at the Gold King Mine north of Silverton. A crowd at 32nd Street waits for signs of the mine waste coming downstream. A toxic leak from the Gold King Mine dumped more than 1 million gallons of contaminants into the river, and it oozed its way from Silverton to Durango.